Mid-July has arrived and the 2015 peach harvest season has begun in earnest. 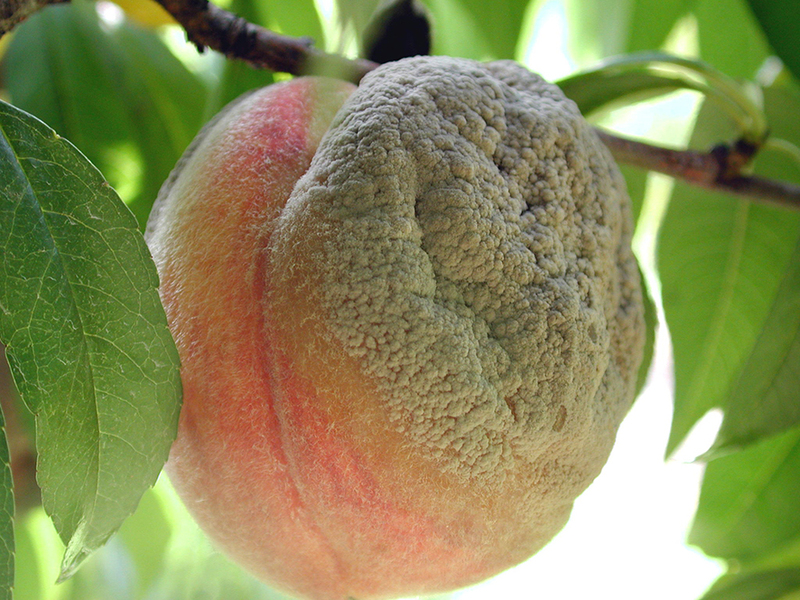 As each successive crop of fruit mature and ripen, they become susceptible to infection by the brown rot fungal pathogen, Monilinia fructicola. Since spores of this pathogen require water to germinate, the number of fruit infection periods and therefore severity of the 2015 epidemic will be very much dependent on the number of rainfalls. Unfortunately, we have had frequent rains so far this growing season. And to make matters worse, many of these rains have been extremely heavy, which results in rapid depletion of fungicide residue. Of course, frequent rains also make it difficult to re-apply fungicides. If the frequency and severity of these rains continue into the major harvest month of August, brown rot management will most certainly be a major challenge this growing season. When developing a brown rot management program, the tendency is to focus on what fungicides to apply. The choice of fungicide, no doubt, is certainly an important part of the control program. 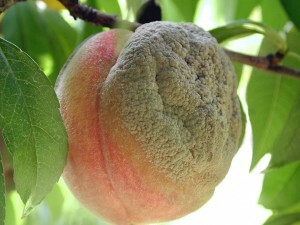 However, many other factors influence brown rot development. And in wet seasons, attention to these other components can be the difference between little or significant yield loss. In this and subsequent articles, we’ll examine some of the most important factors to consider. We’ll begin with a discussion on sources of pathogen inoculum. 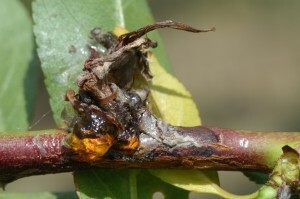 Peach blossom blight canker. Note gum, attached flower parts, and gray colored spores. Blossom blight cankers. Successful infection of flowers by the pathogen during the bloom period results in the formation of blossom blight cankers. These cankers have been observed to sporulate in July and August, thereby providing inoculum for infection of ripening fruit. Thus, effective management of blossom blight during spring can aid in reducing overall inoculum levels during the harvest season. Unlike constriction cankers, blossom blight cankers usually do not girdle the branches. This characteristic makes it much more difficult to find cankers since there will be no dead shoot tips and leaves or “flagging”. One needs to literally get inside the tree canopy and examine current season fruiting wood to find the cankers. Look for necrotic, elliptical cankers at branch nodes. Quite often blackened gum exudate and dead flower parts will be attached. If the cankers are sporulating, gray to tan spores will be visible over some or all of the canker surface and flower parts. To determine your level of risk, arbitrarily select and examine fruiting wood from trees located in the four corners and center of each cultivar block. If you have less than 5% infected shoots (5% = 1 in 20 shoots with at least one canker), then your canker inoculum level can be considered “low” and normal brown rot management practices should suffice. Higher canker levels increase the risk and require much more stringent measures. Don’t assume that all of your peach cultivar blocks have similar levels of canker. Variation in amounts of overwintering inoculum (mummies), time of bloom relative to infection periods, and control practices all influence the incidence of canker formation. For example, on non-treated trees in our Autumnglo, Bounty, and Encore experimental blocks at RAREC this season, we have 81%, 21%, and 68% of shoots with at least one canker, respectively. Green fruit rot on Redgold nectarine. Green fruit. For the majority of growing season, immature green fruit are not susceptible to infection by the brown rot pathogen. However, immature fruit that are not properly pollinated or become injured can become infected and begin to rot. These fruit often remain attached to the tree because the pathogen has killed the abscission layer in the fruit stem that normally allows the fruit to detach (as in the normal ‘June drop’). Thus, these rotting green fruit are well situated in the canopy to provide inoculum to susceptible, mature fruit during the pre-harvest ripening period. 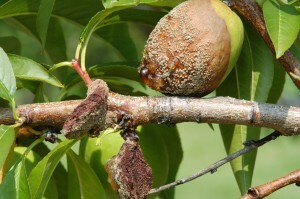 Brown rot symptoms on green fruit are similar to those observed on mature fruit. Infected green fruit will have light to medium brown lesions that maintain the shape of the fruit and are soft but not mushy; gray to tan spores may be present on the surface. Ideally, as a general guideline, infected green fruit should not be observed on more than 1 in 10 trees. Higher levels, especially multiple infected green fruit on individual trees, are cause for concern. If many rotting green fruit are observed in an orchard, then manual removal may well be worth the added expense. Fruit can simply be dropped to the orchard floor. However, this practice should be performed early enough in the summer so that the fruit have time to decompose and stop producing inoculum before the fruit on the tree begin to ripen. Similarly, thinned fruit are not an inoculum source since they will readily decompose on the ground well before the remaining attached fruit begin to ripen. Brown rot on mature fruit. Entire surface of lesion is covered with spores. Mature fruit. As the season progresses, the number of harvested blocks increases. Any fruit not harvested from these blocks can become rotted and are potential sources of inoculum for infection of fruit in yet-to-be harvested blocks. If these blocks (or often rows in the case of a farm market) are adjacent to each other, then spores can easily be transported by wind or blowing rain from one block or row to another. Rotting, mature fruit is a major source of inoculum and is the main reason why disease pressure tends to increase as the season progresses. In the RAREC experimental orchards, non-treated control trees in late cultivars often have high levels of fruit rot, sometimes even 100%, while control fruit in earlier cultivars almost never attain these levels. In a commercial setting, at the very least, any fruit not harvested should be dropped to the ground where they can more quickly decompose. This will also prevent them from becoming mummies, thereby minimizing overwintering inoculum for next year’s crop. Removal of the fruit from the orchard would be best, especially if neighboring blocks are beginning to mature, but this may not be practical. Perhaps the best approach is to use a quality preharvest frungicide program that minimizes brown rot development in the first place. Think of your preharvest program as benefiting soon-to-be harvested cultivars as well as the one being sprayed. In part II of this article series, we will examine some of the factors that influence the ability of preharvest fungicide programs to effectively manage brown rot.